Abso-freakin-amazing! 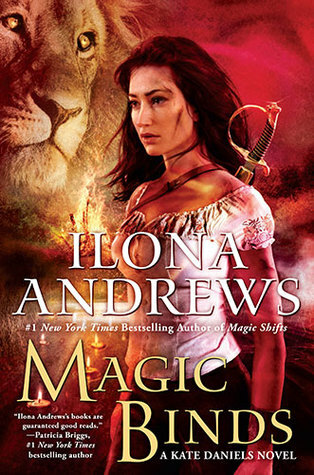 The writing team, Ilona Andrews, once again pens a must read adventure in the ninth installment of the Kate Daniels series, Magic Binds. You’d think after the former Beast Lord Curran retired things would calm down for Kate and Curran. Well you’d be very wrong! With Roland tower building and kidnapping the demigod, and on Kate’s poop list friend, Saiman, things have just gotten a lot more complicated. Friendship will be tested, allegiances and birth rights all come in to play in what is just the prelude to Kate’s and Curran’s wedding plans. You can choose your friends but you can't choose your family. Get ready for another epic romantic urban fantasy in the Kate Daniels series. If you haven’t read this series, you seriously are missing out on one of the best out there. It is pure perfection; a readers dream cocktail, impeccably balancing romance, intense action, world building, character development, fantasy galore and humor. I received this ARC copy of Magic Binds from Berkley Publishing Group in exchange for a honest review. This book is set for publication September 20, 2016.